The neighbourhood association Stuttgart (Nachbarschaftsverband Stuttgart) was founded in 1976 with the single aim of establishing a combined land use plan for Stuttgart and the adjacent municipalities. This land use plan was published under the title "FNP 1990 Nachbarschaftsverband Stuttgart" (Land use plan 1990 neighbourhood association Stuttgart). Apart from a landscape plan, a climate analysis was carried out for the neighbourhood association Stuttgart and adjacent parts of Greater Stuttgart in this context and the results were compiled in the "Klimaatlas Nachbarschaftsverband Stuttgart" (Climatic atlas neighbourhood association Stuttgart). The Department of Urban Climatology within the Office for Environmental Protection of the city of Stuttgart was primarily charged with this task. With the foundation of the Verband Region Stuttgart (a political organisation for Greater Stuttgart) in 1994, the combined land use planning, which had been very useful, was unfortunately abandoned. 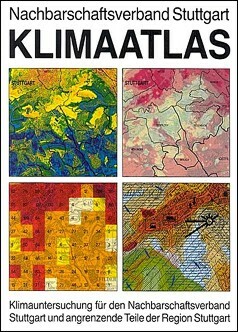 The following deliberations and materials represent the state of the climatic atlas in 1992. Its climate analysis and climate indication maps are still used by the municipalities as planning aid in the context of local climatic conditions. The climatic atlas can possibly be updated and extended to the whole region in the context of the updating of the regional plan.